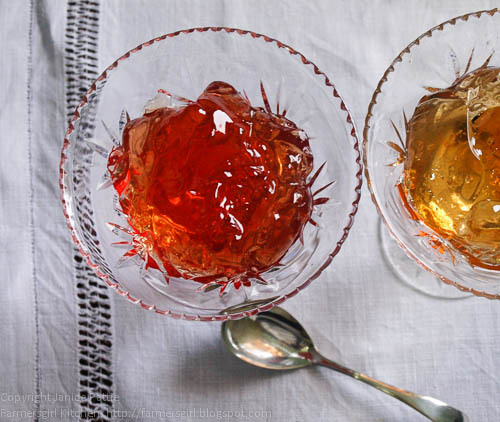 I don't often have the opportunity to use my crystal jam dishes, but for our New Year Day lunch, I filled them with two gloriously vibrant and aromatic jellies bought from local artisan suppliers. 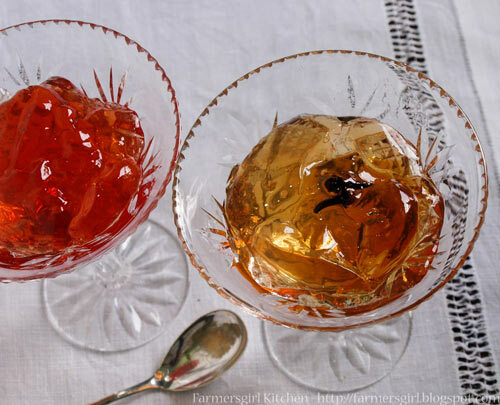 The golden jelly on the right is Clove Apple Jelly produced by Sarah from Creeside Charcuterie to her grandmother's recipe. When I met Sarah at Drumlanrig Christmas Fair, she told me that her gran made this every year from a recipe entitled 'Cinnamon Apple Jelly' but she never made it with cinnamon, always with cloves! 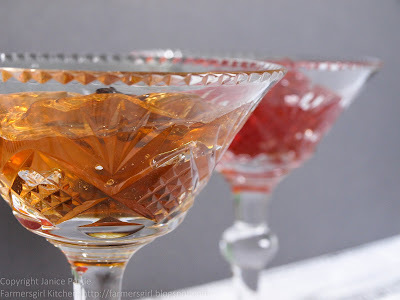 I'm so glad that Sarah decided to continue the tradition and make this jelly, the taste is reminiscent of clove rock, without quite such a sugar rush. If you have never eaten clove rock, it's hard to explain the flavour, not quite apple pie (my mum always put cloves in the apple pie), it's more intense than that, with a spicy kick at the back of your tongue. It is the kind of taste which is an ideal accommpaniment to cold hams and the lovely terrines and pates that Sarah also makes. The pretty pink jelly is made by Margaret of By Heck. Margaret makes a wide range of jams, jellies and chutneys which she sells through local farmers markets. I love the unusual hedgerow jellies she has created, this one is Rowan and Crab Apple Jelly. The rowan adds a mild chilli-like heat to the jelly and it is not too sweet, again perfect with cold meats such as the baked ham we enjoyed yesterday. By Heck doesn't have a webpage, so I've linked to the information about the business on the Savour the Flavours directory. This isn't a PR or sponsored promotion, I just wanted to share my pleasure in this fabulous produce, from the South West of Scotland. What are your favourite locally produced preserves? 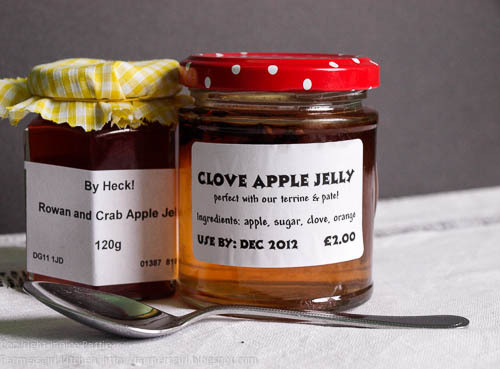 Apple jelly with cloves is my absolute favourite - particularly if it's crab apple jelly.